The Pivitec e32 is a 32-channel Ethernet Audio sourced Personal Monitor Mixer. The flexible design of the e32 supports rack mounting in the Pivitec eRack Kit or mic stand mounted with the Pivitec e32-MSB. Features include high output headphone amp and wireless control from iPad or iPhone using Pivitec's V2Mix Pro application for iOS and stereo line outputs for easy integration with wireless In-Ear monitor systems. 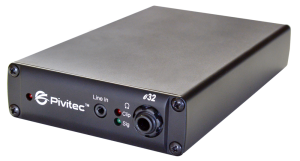 Add more e32 Personal Mixers to support any size band or network requirement. The e32 can also be used in commercial applications requiring distributed audio and control. Its stereo line outs easily interface with power amps or powered speakers and its PoE powered 1⁄3 Rack space form factor means it can fit just about anywhere!